Some footsteps they just can't follow. 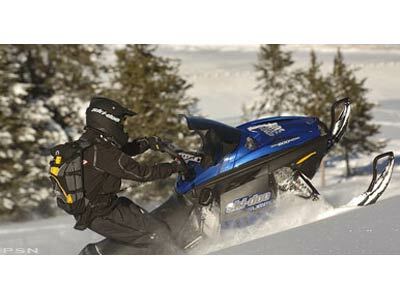 There's no question that the most outstanding performer in the mountains is the Ski-Doo Summit. The athletic Adrenaline package is built on the light and agile REV platform and features a bulging new Rotax 800R engine. 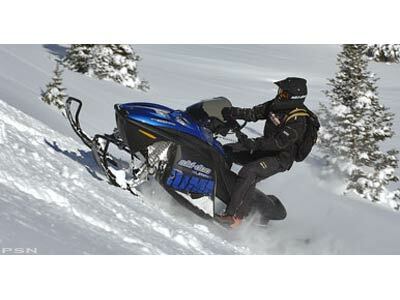 At 151 horsepower, it is the strongest engine in the 800 cc and 900 cc classes. 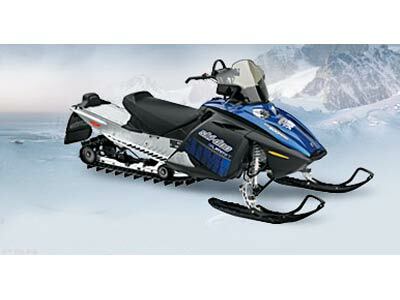 It also extends the Adrenaline's lead in power-to-weight ratio. Choose either the 16 x 144 inch or 16 x 151 inch track to float over the lightest powder you can find and claw your way up the most uninviting inclines. If pure climbing power is your game, the Summit Highmark is made for you. Starting with the incredible 170 horsepower Rotax 1000 SDI engine, it offers more giddyup than anything you'll find west of the Mississippi. The new lightweight Challenger Lite track design makes sure that all that power has the traction to get you as high as you want to go. Round the package out with Pilot 6.9 skis and a 15 pound weight reduction, and you'll have a hard time finding someone to highmark against.